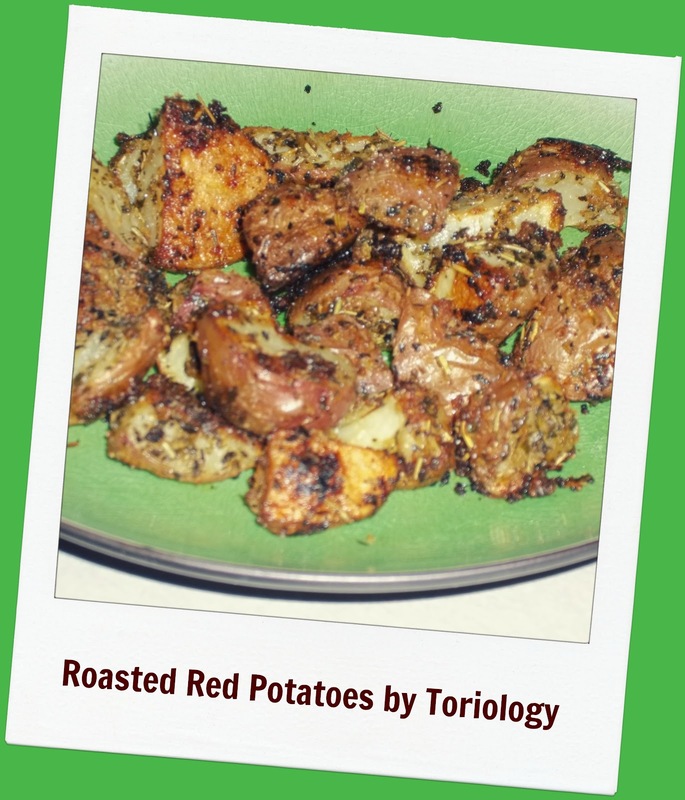 FoodThoughtsOfaChefWannabe: Roasted Red Potatoes, you know, how TORIOLOGY does it! 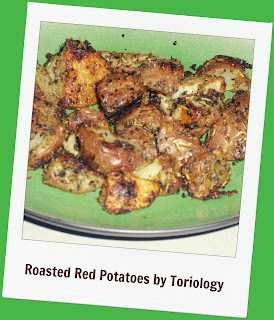 Roasted Red Potatoes, you know, how TORIOLOGY does it! Good Morning foodies! This poor blog has been a trainwreck! I have collaborated with my newest foodie friend Victoria over at Toriology, I made my dish, *we recipe swapped*, left it in the oven 10 minutes to long because the dog ran out the front door, had it all typed up and apparently forgot to save it. So this is going to be try number 2!! So as Victoria puts it, she was all alone on the foodie playground, when in reality, who could resist her kindness and sweetness? I am so thankful she is part of my foodie world *and my non foodie world*. I love when you find that handful of people you just know you would be great friends in the flesh, if you didn't live 1500 miles away! So I was reading through her recipes and this one caught my eye for a couple of reasons. First, it was going to go perfectly with my roasted chicken, and secondly, it was potatoes, WITH breadcrumbs. I am sorry but for a carb-a-holic, this is my heaven folks. They looked delicious, yes, please look at HER photo because her dog *if she has one* obviously didn't decide to sabatage her blog recipe! Even though they look a little more brown than they should in my photo, they were NOT burned and tasted amazing. The texture of them is like so amazing. The potatoes get a little crunchy and with the addition of the bread crumbs and parm, seasonings and olive oil it makes this crunchy breading almost on the outside. I don't know guys, just make them, just do it, because you are missing out if you don't! They are so versatile as well, you can use any spice you want on them so you can suit them to your families taste! Extra seasonings which you can change out for anything you like. I used..
Preheat your oven to 375 degrees. Make sure to wash and slive your potatoes. I quartered mine because they were so cute and little. Add all of your seasonings, breadcrumbs, cheese and drizzle with your olive oil. Toss to combine. It will look something like this! I lined my baking sheet with parchment paper, just because I like easy clean up. Dump your potatoes on and do NOT cook them 10 extra minutes. Bake them at 30-40 minutes, and halfway through give them a flip, toss or shake so they can get crispy and good on all sides! Like I said, these are SO good. I can't think of much they won't compliment in a meal. Try them, and then come back and let us know how you loved them too! Make sure to visit Victoria at Toriology, or LIKE her on Facebook Facebook-Toriology, or on Twitter. Let her know chefwannabe is gonna work her way through her recipe index as soon as possible and you should too!! !